Fr. Andreas Blom was born and raised in Sweden. He grew up in a loving, albeit non-religious family, and it wasn’t until he was a teenager that he started to have spiritual and existential questions. Being of a secular atheist background, he began seeking answers for his many unanswered questions in both Oriental religions and various Western offshoots, but without much resolution. Much to his own surprise, he eventually had a spiritual encounter with Christ in a Protestant Evangelical congregation, which encouraged him to read the Bible and pray. He realized the treasure he had found in Christ, and had a deep desire to share it with others. This led him to work in international missions, and in 1996 he moved to Colorado Springs, CO where he joined an Evangelical missions organization called Youth With A Mission (YWAM). He spent almost a decade working with missionary work and development projects in Asia, primarily in China and India. In 1999 he met his future wife, also missionary, who worked in tribal areas of northwestern India. They were married the following year. Fr. 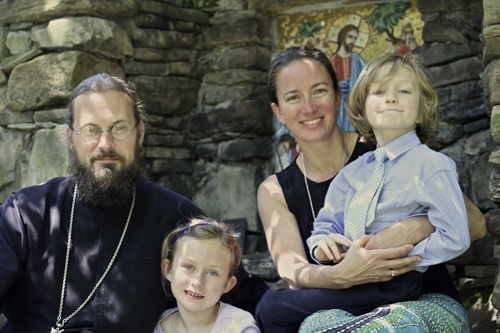 Andreas is a graduate of St. Tikhon’s Orthodox Theological Seminary, where he received his M.Div in 2012. He was ordained a priest in 2011, and has served in Archangel Gabriel’s Orthodox Church since July, 2012. Fr. Andreas and Matushka Theodora have two children, Anna and Theodor.